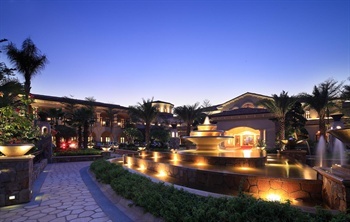 The Mayland Resort (Meilinhu Wenquan Dajiudian) is a luxurious 5-star hotel enjoying a quiet location near Shanqian Avenue. The hotel is 35 km (22 mi) from Guangzhou Baiyun International Airport and Pazhou International Exhibition Centre is a 70-mintue drive away. This Qingyuan resort hosts spacious guest rooms complete with a flat-screen TV with cable channels and tea/coffee making facilities. In addition, there are six independent villas upon request. For those choosing to dine in, the hotel offers two restaurants serving both Chinese and Western delicacies. Guest may also spend an afternoon sitting in the bar or cafe socializing. Meeting facilities and a business center are on offer at Qingyuan hotel. Other offerings include free parking and airport pickup service. When it comes time to relax, massage services can be enjoyed at the spa. Guests can enjoy activities such as fishing and golf, games of tennis, billiards and darts. The hot spring pools are also a good place to relax.